Not all art is good art. There is a very small percentage of art that even gets the opportunity to hang in galleries and on museum walls. Some art earns that label of being kitsch, essentially, done in bad taste, but when it really ruffles the feathers of enough people, it tends to earn that other word: controversial. But what if the reason the art is not seen isn't because it's controversial, but because the people that are making these decisions -- the museum and gallery curators, find it distasteful and somewhat tough to look at? What if some curators found the work so morally wrong that they decided to write lengthy rejection letters to the artist to tell him so. This scenario happened to photographer Rick Ashley. No, Rick Ashley isn't the next Robert Mapplethorpe. We live in a different era now where we don't experience the kind of protest Mapplethorpe did in 1989 for his exhibition The Perfect Moment or maybe the kind Andres Serrano did when he unveiled the photograph Piss Christ to the world. What Ashley did was create a series of portraits of his brother-in-law Michael. Michael has Down syndrome. Ashley has been photographing his brother-in-law since 1975. They began collaborating on a series of staged portraits about five years ago -- some scenes made to look like something out of an Edward Hopper painting, while others are of his own invention. 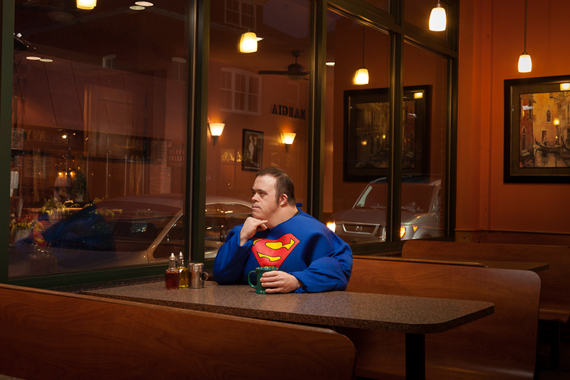 Michael often likes to dress up in his favorite Superman costume -- if that's the case, that's what he's photographed in. As Ashley states, "Back in the Renaissance, people would often dress up in their best regalia to have their portrait painted. Michael doesn't have an agenda, but he knows what he likes to be photographed in." The first time I saw these images was in 2009. 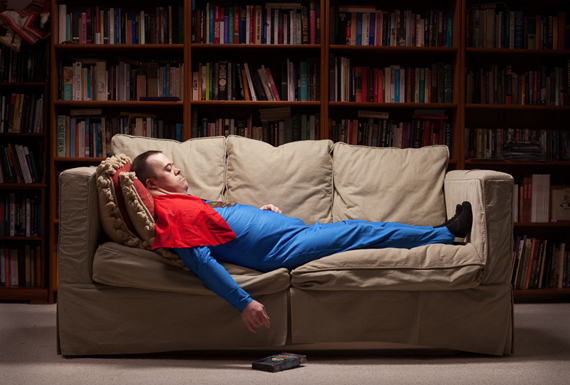 Over the past five years, they have continued to change as Ashley has moved on from just photographing Michael in the Superman costume, to setting up more staged narratives to address identity, character and the superficial poses that often times appear in studio portraiture. "More of what the images are about now have to do with these preconceived notions about what people look like," says Ashley. "It began as an investigation into the use of artifice in portraying people both in photography and painting. I continue to challenge how I can alter our perceptions of people through the images." When they were on display last year, they received varying responses. There were those who thought they were beautifully done, while others jumped on the "I don't like this" bandwagon or thought they were "disturbing." But what if they learned that these were in fact self-portraits done by Michael, would that have changed their perceptions? They are not self-portraits, but it does make you think, right? People often times dismiss what they do not understand. Maybe having a cousin who has Down syndrome, who I love like a brother, made looking at, liking and understanding these images a little easier for me. 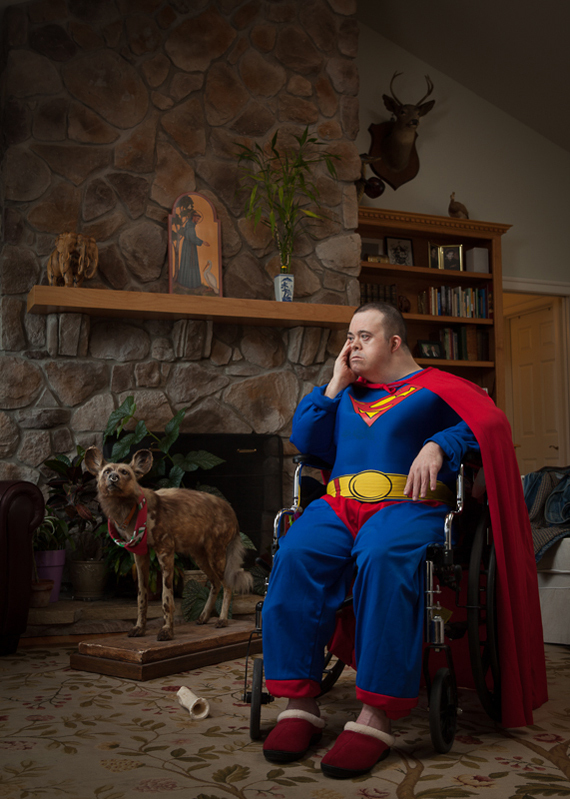 Since their initial exhibition at Panopticon Gallery in Boston, Ashley's images of Michael have exhibited at the Danforth Museum in Framingham, Mass and went on to earn one of the top Massachusetts Cultural Council Grants in Photography in 2013. You can see this work on display through May 17th at the Photographic Resource Center in Boston in the exhibition Fall Back, Spring Forward as part of the Magenta Foundation Flash Forward Festival.